Cana, Galilee, 23 A. D.
'They have no wine', said Mary to Jesus. And on the third day there was a marriage in Cana of Galilee; and the mother of Jesus was there. And both Jesus and his disciples were called to the marriage. Mary immediately ordered the servants to do whatever Jesus instructed. And Jesus told them to fill the pots with water up to the brim. He then asked them to draw wine from them and to serve the governor of the feast. The servants served the wine. When the ruler of the feast tasted the water that had been made into wine, the governor called the bridegroom and said to him that most people serve the good wine first the lower grade wine later. The bridegroom, on the other hand, had done the reverse. His mother, Mary, had clearly been in charge. She was the hostess without doubt. And the bridegroom had been Jesus. - The Christ Conspiracy: The Marriage of Jesus by Rhawn Joseph. Mary anointed Jesus twice with Nard. She once anointed his head. 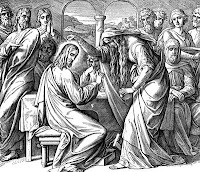 Another time she anointed his feet, later wiping them with her long hair. Nard was a fragrant ointment more commonly called Spikernard and was part of a sacred marriage ritual practiced by Hebrew, Sumerian and Egyptian priestesses. In the Old Testament's Song of Solomon, this act of anointing was carried out as an element of the marriage ceremony. She was making Jesus go through an ancient fertility ritual called Hiero Gamos, or 'the Sacred Marriage'. 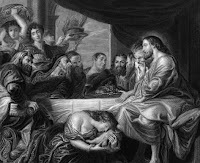 In 1993, a book entitled 'The Woman with With the Albastar Jar' by Margaret Starbird reveals: 'Jesus had a secret dynastic marriage with Mary of Bethany. She was a daughter of the tribe of Benjamin, whose ancestral heritage was the land surrounding the Holy City of David, the city of Jerusalem. A dynastic marriage between Jesus and a royal daughter of the Benjamites would have been perceived as a source of healing for the people of Israel. Perhaps the earliest verbal references attaching the epithet Magdala to Mary of Bethany's name had nothing to do with an obscure town in Galilee in Hebrew. The epithet Magdala literally means tower or elevated, great, magnificent ... This meaning had particular relevance if the Mary so named was in fact the wife of the Messiah. It would have been the Hebrew equivalent of calling her Mary the Great (or, Mary the Magnificent). Then Mary stood up and greeted all of them and said to her brethren, "Do not mourn or grieve or be irresolute, for his grace will be with you all and will defend you. Let us rather praise his greatness, for he prepared us and made us into men (perfected beings)." When Mary said this, their hearts changed for the better, and they began to discuss the words of the [Savior]. Peter said to Mary, "Sister, we know that the Savior loved you more than other women [John 11:5, Luke 10:38-42]. Tell us the words of the Savior which you have in mind since you know them; and we do not, nor have we heard of them." ... Levi answered and said to Peter, "Peter, you are always irate. Now I see that you are contending against the woman like the adversaries. But if the Savior made her worthy, who are you to reject her? Surely the Savior knew her very well [Luke 10:38- 42]. 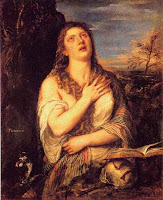 For this reason he loved her more than us [John 11:5].
. Who was Mary Magdalene?